Lentils are traditionally served at many New Year’s dinners throughout Italy. With their coin-like shape, they are believed to represent good fortune and money in the coming year. They are commonly served with either cotechino or zampone. 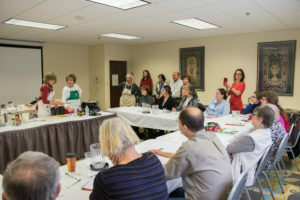 Jody Perrecone and Mary Ann Ferruggia demonstrate how to make Italian Lentil Soup to participants at the 2017 IFAFA Conference in Rockford, IL. In a large stockpot over medium heat, sauté the onions, leeks, and garlic with the olive oil, salt, pepper, and cumin for 20 minutes, until the vegetables are translucent and tender. Add the celery and carrots and sauté for 10 more minutes. Add the stock, tomato paste, and lentils. If you have a Parmesan rind hanging around, add that too. Cover and bring to a boil. Reduce the heat and simmer, uncovered, for 1 hour, until the lentils are cooked through. While the soup is simmering, add water to a medium-sized saucepan and bring to a boil. Add pasta and cook until al dente. Drain and set aside. Taste and adjust any seasonings of the soup. Add a handful of the cooked pasta to each soup bowl. 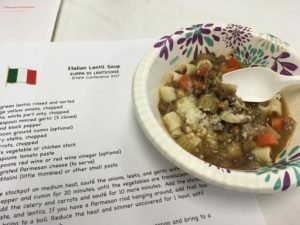 Ladle the soup into the bowl. Add the red wine and serve, drizzling the top with olive oil, and finish with grated Parmesan cheese.